To Cite: Nazari M, Basiri F , Kaveh M H, Ghaem H. Investigating the Effect of Fordyce Happiness Cognitive-Behavioral Training on Perceived Stress and Happiness in Pregnant Females: Applying the Self-Efficacy Theory, Iran Red Crescent Med J. 2018 ; 20(10):e59284. doi: 10.5812/ircmj.59284. Background: Pregnancy is a stressful period in a woman’s life and can lead to undesirable outcomes both in the mother and fetus; therefore, more attention should be paid to improve the mental health of pregnant females. Objectives: The purpose of this study was to investigate the effect of Fordyce Happiness Cognitive-Behavioral training based on self-efficacy on perceived stress and happiness in pregnant females. Methods: This randomized clinical controlled trial with a pretest-posttest design was performed on 100 pregnant females, who were randomly assigned to two groups, training and control, in Gerash, Fars, Iran (2016). Fordyce Happiness Cognitive-Behavioral training based on self-efficacy was done in the intervention group and there was no intervention for the control group. The data was collected by applying the demographic questionnaire, Oxford Happiness Inventory (OHI), and Perceived Stress Questionnaire (PSS-14) in two stages, before and after the intervention. The P&lt was 0.05 and was considered as significant. Results: The results showed significant differences in the median scores of happiness and perceived stress in the experimental group before and after the intervention (P < 0.05). In other words, the median score of happiness increased (124 (19.25) and 141 (16.5); P < 0.001) while the stress score decreased (30.5 (7) and 22.5 (9); P < 0.001). In contrast, this research found a decrease in the happiness median score (123 (40) and 117.5 (32); P < 0.001) and increase in perceived stress scores (30 (7.25) and 33 (9.25); P = 0.009) in the control group at the end of the study, which was significant in comparison with the pre-intervention measurements (P < 0.05). In addition, an inverse relationship was revealed between stress and happiness (P < 0.001). Conclusions: Appropriate educational interventions based on theories are recommended to increase mother’s happiness and decrease their stress during pregnancy. Stress is an independent or isolated event and also interacts with other psychosocial and health-related factors, which can alter individuals’ perceived stress (1). Evidence indicates a strong relationship between high prenatal stress and adverse conditions and unwanted problems for the mother and the infant after birth (2). A study demonstrated that about 36.1% of females experienced some level of stress during their pregnancy (3), while it was estimated to be more than 64% in Iran (4, 5). The psychosocial status can influence the pregnancy outcome both directly (through mothers’ physiological conditions) and indirectly by the change in maternal health behaviors (6). Stress in pregnancy can yield undesirable results, such as changes in pituitary and hypothalamus functions, rise in stress hormone levels, possibility of respiratory distress in infancy (7), preterm birth, need for intensive care, low Apgar score, low fetal weight (8), chromosome abnormalities, shortness, and spontaneous abortions (9). Thus, mother’s adaptation is required to cope with psychological changes (10). Pregnant female’s perceived stress can be controlled through non-medical psychological methods (11). Several studies have shown an inverse relationship between happiness and stress (12, 13). Happiness can be defined as an indicator, by which people can assess their overall life with “positive attitude” (14). Fordyce's Happiness Training Program has been recognized as a valorous factor in achieving a level of positive thinking in regards to life events and adapting to one's surroundings and occurrences, leading to lower stress (15). Fordyce developed a program consisting of 14 elements to increase the community’s happiness. This program has eight cognitive and six behavioral elements, including, lowering expectations, rising positive thinking and optimism, better planning, living at present, reducing negative emotions, avoiding anxieties, developing a healthy personality, prioritizing happiness, increasing activities, increasing social relations, increasing intimacy, raising social personality, creativity, and self being. Fordyce believed that training individuals regarding these components could enable them to increase their happiness (16). Similarly, Bitsko indicated the influence of happiness training on quality of life and depression among adolescents with leukemia (17). A study by Khayeri et al. showed that Fordyce Happiness Training Program reduced stress, depression, and fatigue in patients with MS (18). Research has shown that the most effective training programs are based on theory-based approaches that have their roots in behavior change (19). Bandura stated that self-efficacy played an important role in psychological adjustment, mental health problems, and developing strategies for behavior change and counseling (20). Hence, it is considered to be an important prerequisite for behavior change, which can express human behaviors as the interaction between cognitive determinants of behavior and the environment. The importance of self-efficacy should also be taken into consideration in health education (21). According to Bandura, there are four primary sources for building self-efficacy; i.e., previous successful experiences, experiences of succession, verbal encouragement, and emotional arousal (22). Maintaining and improving the health of females, especially during pregnancy, is very important, and in this regard, their empowerment in coping with stress is very important, given the evidence provided. Happiness training can be considered as a preventive intervention program for the purposes mentioned above. Given the lack of interventional studies, in particular, theory-based approaches to assess the effects of learning happiness, it seems that the present research can answer some possible questions and develop knowledge in this field. The objective of this study was to evaluate the effect of Fordyce happiness cognitive-behavioral training based on self-efficacy on perceived stress and happiness in pregnant females. 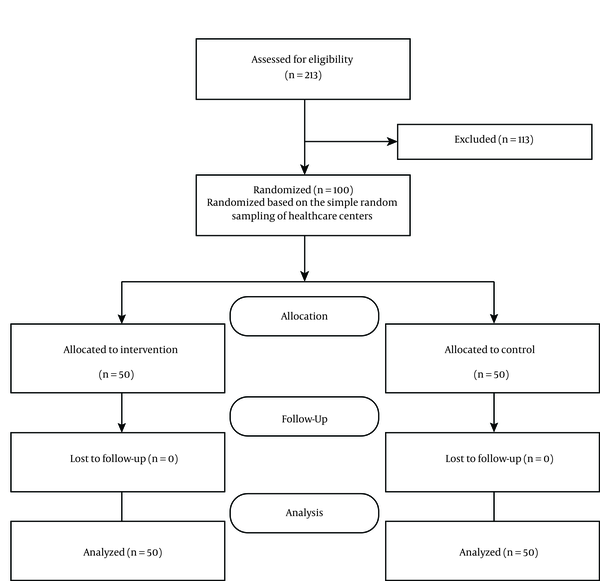 This randomized clinical control trial with a pretest-posttest with an intervention group and a control group design was carried out on 100 pregnant females (gestational age of 14 to 25 weeks) in Gerash, Fars, Iran. The sample size was determined by MedCalc software and based on information extracted from the results of a study done by Ghomi Avili et al., assuming a mean difference of 2.9 between the two groups and considering α = 0.05 and power (1-β) of 80%. The sample size was determined for the study as 48 subjects in each group (Equation 1). However, considering the probability of loss, the sample size was increased to 100 for this study; 50 pregnant females in each group. There were no missing values (23). It should be noted that there are only two urban health centers in Gerash city, located in the south of Iran. Thus, in order to meet homogeneity in terms of social, economic, and cultural factors, participants from both centers were enrolled in the study. To reduce women’s contact with each other, one of the centers was selected randomly following simple randomization as the control group, while the other was considered as the intervention group. Initially, the researcher referred to the healthcare centers and checked the files at healthcare centers based on the inclusion criteria; the phone numbers of women were extracted, and then the women were invited to attend health centers on certain days. Participants were selected from pregnant females referred to healthcare centers (governmental and not a referral) affiliated to Gerash University of Medical Sciences, from January to March 2016. According to the inclusion and exclusion criteria, 100 subjects were included and 113 were excluded. The flowchart of the study is shown in Figure 1. The trend of the study was fully explained to the subjects. Subjects were assured about the confidentiality of their information. Moreover, written informed consents were obtained from all participants. Concurrently, the pregnant females were asked to fill out self-administered questionnaires (three form of pretest) that took about 15 minutes to complete. In doing so, codes were used for completing the questionnaires. The intervention group was divided by simple random sampling to two groups of 25 each, to facilitate training, interaction, and active learning. The control group did not receive any intervention. The questionnaires were again completed by both groups one month after the intervention. This study was conducted with two health care centers, and 213 females were assessed for eligibility; 113 females did not meet the eligibility criteria, and 100 of the remaining declined to participate in the study. The inclusion criteria of the study were gestational age of 14 to 25 weeks, having at least primary school degree, having the ability to regularly participate in educational sessions and no history of a psychological disease. The exclusion criteria were being absent in more than one training session, failure to complete the posttest, and unwillingness to cooperate at any stage. There was no significant difference in demographic variables among participants (Table 1). Oxford Happiness Questionnaire (OHI) included 29 items that were responded through a six-point Likert scale, ranging from strongly agree to strongly disagree. The minimum and maximum scores of this scale were 29 and 174 (24). The validity of this questionnaire was approved by Alipoor et al. Furthermore, its reliability was evaluated in a study on 110 students at Allameh Tabatabaei University, revealing Cronbach’s alpha of 0.98 (23). Perceived Stress Questionnaire (PSS-14) primarily designed by Cohen et al. focuses on evaluating the mental ability to cope with specific events and internal reactions against events (6). It also assessed general perceived stress during the last month besides the thoughts and feelings about stress and how to control, overcome, and cope with stress and stressful experiences (25). This questionnaire contained 14 items that were responded through a five-point Likert scale. The reliability of PSS was reported to be 0.84 and 0.86 in two groups of students and a group of smokers, respectively (23). The demographic questionnaire assessed the female’s economic status, occupation, education level, exercising status, smoking status (Hookah, etc. ), homeownership, satisfaction with the fetus’ gender, disease history during the previous pregnancy, infertility, hyperemesis gravidarum, planned or unplanned pregnancy, being pleased with their marriage partner, parity, and age. The educational training was held twice a week for four weeks during 90 minutes. The educational sessions were held on Mondays to Thursdays for one group and Saturdays to Tuesdays for the other group. The educational intervention was performed based on Bandura’s self-efficacy theory to promote happiness (based on 14 Fordyce principles). Outlines of the interventional program: First session: After an introduction and stating the purpose of the study, stress in pregnancy was defined, its impression on both the mother and fetus was clarified, and healthy character features, happiness, and its necessity and importance were identified. The techniques used in this session included verbal encouragement and emotional arousal. Next, some participants were asked to state the summary of the meeting. In addition, they were asked to form a virtual group to share their experiences, feelings, concerns, and questions. The second session: After reviewing the importance of happiness, the techniques to increase positive thinking were thought. Optimism and its stages (optimism about self, others, and future) and benefits were discussed. The techniques used in this session were emotional arousal and statement of previous successful experiences. At the end of the meeting, the participants were asked to express their feelings about pregnancy. Third Session: The techniques of reducing negative emotions and avoiding anxieties were introduced and explained. The participants also became familiar with how to develop a healthy personality and prioritize happiness. The techniques used in this session were stating their previous successful experiences and verbal encouragement. At the end of the meeting, the participants were asked to discuss one of their concerns. Fourth session: Social enhancement techniques, the importance of social relationship as a shield against stress, and techniques to increase intimacy as the primary source of happiness were emphasized. It was also explained that all people need intimacy in addition to their common relations to express their feelings easily. The techniques used in this session were previous successful experiences and emotional arousal. At the end of this session, all participants were asked to name their supporters, describe their roles in pregnancy, and express their feelings about participating in the virtual group. Fifth session: The technique of living at present was introduced and discussed. Self-being, social personality, and not worrying about others’ judgments were emphasized, as well. The techniques used in this session were experiences of succession and emotional excitement. At the end of this session, all participants were asked to listen to their fetus’ heartbeat by sonic-aid (fetal heart detector) and to express their emotions. Sixth session: The technique of promoting creativity was introduced. Additionally, the effect of creativity and diversity on happiness, technique of minimizing expectations, and its impact on happiness was explained to the mothers. The techniques used in this session were verbal encouragement and experiences of succession. At the end of the session, all participants were asked to bring pictures of what they had created, share them in the virtual group, and state all their material and spiritual assets. Seventh session: Techniques for better planning, and their impact on happiness were introduced. Techniques for increasing physical activity were stated, as well. Some successful exercises during pregnancy were also trained. The techniques used in this session were the statement of previous successful experiences and verbal encouragement. Education was provided through lectures, group discussions, question and answer sessions, PowerPoint, video, and handbooks. Additionally, some questions were posed, and an overview of all stated techniques was done at the beginning of every session. Moreover, an online social network consisting of 50 pregnant females was created to review the educational content, photos, and videos, answer questions, and share their pleasant experiences. Due to anonymity, most females felt comfortable and open to ask questions. Finally, the collected data were analyzed using the IBM SPSS Statistical Software for Windows, version 22.0, (IBM Corp., Armonk, N.Y., USA) based on the per- protocol analysis. Descriptive statistics included mean, Standard Deviation (SD), median (IQR), and number (percentage). Normality was tested using the Kolmogorov-Smirnov test; perceived stress and happiness variables did not have a normal distribution thus the nonparametric method was used. Mann-Whitney and Wilcoxon’s test were used for the analysis. Mann-Whitney test was used to compare the two groups in the median scores of stress and happiness before and after the intervention. Wilcoxon test was also employed to compare the changes in the median scores of stress and happiness in each group before and after the intervention. Moreover, quantitative and qualitative demographic variables were analyzed using independent t-test and Chi-square test, respectively. Finally, Spearman’s correlation was utilized to determine the correlation between stress and happiness. P values of < 0.05 were considered statistically significant. This study was approved by the Ethics Committee of Shiraz University of Medical Sciences (code: IR.sums.REC.1394.189). The trial was registered at the Iranian registry of clinical trials at http://www.irct.ir under the code number: IRCT201602157816N9. Distribution of the pregnant women’s demographic information has been presented in Table 1. Their mean age was 28.80 ± 4.89 years in the intervention group and 26.98 ± 5016 years in the control group. Before the intervention, the results did not show any statistically meaningful difference between the two groups in age (P = 0.675), parity (P = 0.14), income (P = 0.129), occupation (P = 0.269), education level (P = 0.736), exercising (P = 0.751), smoking (P = 0.316), homeownership (P = 0.824), happiness with fetus’ gender (P = 0.246), infertility history (P = 0.715), disease history during the previous pregnancy (P = 0.464), hyperemesis gravidarum (P = 0.784), type of pregnancy (P = 0.161), and being pleased with their marriage partner (P = 0.362), respectively. It should be noted that since some of the participants were primiparous, they did not respond to the question about the history of diseases in the previous pregnancy. Therefore, only 55 participants answered this item. None of the participants (n: 100) stopped their participation till the end of the study. The results of the Mann-Whitney test revealed no significant difference between the two groups regarding the median scores of happiness and perceived stress before the intervention (P > 0.05). However, a significant difference was observed in this respect after the intervention (P < 0.05). Moreover, the results of the Wilcoxon Test indicated a significant difference in the intervention group’s median scores of happiness and perceived stress before and after the intervention (P < 0.05) (Table 2). Accordingly, the median score of happiness increased from 124 to 141, while the median score of stress decreased from 30.50 to 22.30. The results of Wilcoxon also revealed a significant difference in the median scores of stress and happiness in the control group before and after the intervention (P < 0.05). Accordingly, the median score of happiness decreased from 123 to 117, while that of stress increased from 30 to 33 (Figures 2 and 3). Abbreviation: IQR, inter quintile range. a Comparison of median scores in the intervention and control groups before and after the intervention based on Wilcoxon test. b Comparison of median scores between the intervention and control groups after the intervention based on Mann-Whitney test. c Comparison of median scores between the intervention and control groups before the intervention based on Mann-Whitney test. The results of Spearman’s correlation showed an inverse correlation (-0.674) between stress and happiness (P < 0.001) (Table 3). Pregnancy concerns contribute to the strong and effective relationship between high levels of maternal stress and its unpleasant consequences in both mothers and children (26). The present study aimed at investigating the effect of Fordyce Happiness Cognitive-Behavioral training based on self-efficacy on perceived stress and happiness in pregnant females. In the present study, before the intervention, the scores of stress and happiness between the two groups were not statistically significant. The results revealed the effectiveness of the intervention in both variables. In the intervention group, the level of happiness increased, while the score of stress decreased significantly after the intervention. However, in the control group at the end of the study, the result was the opposite, and happiness decreased and stress increased (third trimester). In this study, the researchers trained Forde's Happiness Program using the resources of self-efficacy theory for pregnant females and showed results of increased happiness and decreased perceived stress in pregnant females. Generally, happiness as a positive emotion plays an important role in psychological interventions, both at individual and group levels (27). Three contributing factors to happiness include fixed starting point (genetic fitness), conditions (socioeconomic status), and deliberate actions. The first and second factors are relatively fixed and static, yet the deliberate action is a variable factor. Deliberate action refers to intentional actions focused on cognitive aspects, behavioral aspects, and intentional requests. Consequently, intentional actions have the highest range of change and control (28). This method is based on the fundamental assumption that thoughts, emotions, and behaviors are interconnected, and cognitive distortions are found as a result of learning and can be eliminated through learning. Similar results were also achieved in other studies conducted on happiness training (29, 30). The study of Rabiee also showed that the Fordyce Happiness Training Program in the experimental group, compared to the control group, significantly reduced the rate of depression in pregnant females (31). In the study by Nasirlou, Fordyce happiness training led to improved quality of life (QOL), and mental health (reducing depression, anxiety, and stress) of patients with cancer and diabetes (32). Furthermore, Bitsko reported the effect of the happiness program on quality of life and depression in adolescents with leukemia (17). Another study conducted by Feicht et al. indicated that web-based, seven-week happiness training increased happiness and life satisfaction and reduced perceived stress in an occupational setting (33). For instance, a meta-analysis of 50 studies conducted on more than four thousand subjects indicated that positive psychological interventions increased happiness, decreased depression, and improved public health (34). The researchers did not find any study that opposed the results of the current study, however, the difference between this study and previous studies was in the number of sessions, as well as the use of components of self-efficacy theory in training happiness. Self-efficacy is effective in individuals’ emotions, thoughts, and performances. Thus, if an individual believes that he can do something, his chance of success will increase accordingly (35). The results of the educational intervention based on Bandura’s self-efficacy to promote happiness showed that learning, obtaining new psychological habits, and their reinforcement resulted in higher success. These results were consistent with those of studies on the effects of educational interventions based on self-efficacy on breastfeeding, its duration, and exclusive nutrition (36), burnout, job promotion (37), women’s general health (38), post-traumatic stress, and secondary posttraumatic growth in healthcare personnel (39). Moreover, the current study results revealed an inverse relationship between happiness and stress. Accordingly, increased stress reduced happiness and vice-versa. In the same line, Horiuchi et al. carried out research on students and disclosed that happiness decreased the level of negative moods after facing stressors (40). The results of the study done by Gholamali Lavasani et al. also showed a decreased level of educational stress after training Fordyce Happiness Theory (41). Khodarahimi, too, reported a significant negative correlation between happiness and anxiety among adolescents and young adults (27). Similar results were also obtained by Piqueras et al. in their research on the 3461 Chilean College students (42). In addition, Feicht et al. proved the efficacy of happiness education (within seven weeks) on psychological well-being, happiness, enhance mindfulness, flourishing, and reduction of stress among staff (33). In the present study, the level of happiness gradually decreased, while the score of stress increased in the control group. This implies that the level of stress increased in the third trimester in the control group, which is in agreement with previous studies (43, 44). The last trimester of pregnancy is more stressful and more distressing (45). According to the current findings, the educational program designed based on self-efficacy theory could significantly increase the happiness level in pregnant females. In the current study, a virtual social group was created via the telephone in the intervention group. All participants were satisfied with the time of the study, costs, anonymity, chance of recall, friendly atmosphere, similar conditions for all subjects, having access to the answers to their questions, knowledge promotion, possibility of staying at home, proper volume of information, and diversity and attractiveness of the content. Additionally, the pregnant mothers called for the continuation of educational sessions even after childbirth and during infancy. To sum up, it should be mentioned that happiness training did not change life opportunities, yet influenced individuals’ attitude about life, surroundings, and life issues. Since both questionnaires (perceived stress and happiness) are most widely used as psychological instruments, the participants’ moods might have been influenced by pleasant or unpleasant events, just before filling out the questionnaires. To solve this problem, the participants were asked to consider their general state. They were also permitted to fill the questionnaires individually not to be affected by group presence. The educational program and follow-up periods were short. The strong point of the current study was the chance of reminding and reinforcing the content via a social media group. Indeed, the education was done within groups and with maximum interaction among the participants. The current study findings showed that happiness training based on the self-efficacy theory had a significant effect on reducing stress and increasing happiness in pregnant females. In order to evaluate the effectiveness of Fordyce's Cognitive-Behavioral training, variables such as emotional states (such as depression and anxiety) and physiological symptoms should also be measured. Consequently, this training can be used to prevent stress-related problems in both the mother and fetus. Moreover, since pregnancy is a vulnerable and important period for both the mother and fetus, happiness training can be considered as a preventive interventional program. Furthermore, since prevention is preferred over treatment, this study can be effective in improving the health of mothers and children. Health care teams should be advised to care about the mental health of pregnant females along with their physical care. This article was extracted from Fatemeh Basiri’s M.Sc. thesis approved and financially supported by the Research Vice-chancellor of Shiraz University of Medical Sciences (Proposal No.10100). Hereby, the authors would like to thank Ms. A. Keivanshekouh at the Research Improvement Center of Shiraz University of Medical Sciences for improving the use of English in the manuscript. Authors' Contribution: The conception and design, drafting of the article, critical revision of the article for important intellectual content, final approval of the article: Mahin Nazari; the conception and design, drafting of the article, provision of study materials or patients, performing of the intervention, collection and assembly of data: Fatemeh Basiri; analysis and interpretation of the data and statistical expertise: Haleh Ghaem; the drafting of the article, administrative, technical, or logistic support: Mohammad Hossein Kaveh. Financial Disclosure: The thesis was approved and financially supported by the Research Vice-Chancellor of Shiraz University of Medical Sciences. Funding/Support: This study was funded by the Deputy of Research and Technology of Shiraz University of Medical Sciences, Shiraz, Iran (research no: 10100). 1. Solivan AE, Xiong X, Harville EW, Buekens P. Measurement of perceived stress among pregnant women: A comparison of two different instruments. Matern Child Health J. 2015;19(9):1910-5. doi: 10.1007/s10995-015-1710-5. [PubMed: 25652063]. [PubMed Central: PMC4522194]. 2. Carolan-Olah M, Barry M. Antenatal stress: An Irish case study. Midwifery. 2014;30(3):310-6. doi: 10.1016/j.midw.2013.03.014. [PubMed: 23684696]. 3. Li Y, Zeng Y, Zhu W, Cui Y, Li J. Path model of antenatal stress and depressive symptoms among Chinese primipara in late pregnancy. BMC Pregnancy Childbirth. 2016;16(1):180. doi: 10.1186/s12884-016-0972-2. [PubMed: 27439302]. [PubMed Central: PMC4955111]. 4. Mardanihamule M, Ebrahimi E. [Mental health status of pregnant women referring to shahinshahr health care centers]. J Res Dev Nurs Midwifery. 2010;7(1):27-33. Persian. 5. Alipour Z, Hajizadeh E, Lamyian M. [Anxiety during pregnancy: A risk factor for neonatal physical outcome?]. J Urmia Nurs Midwifery Facult. 2011;9(1):30-8. Persian. 6. Vijayaselvi R, Beck MM, Abraham A, Kurian S, Regi A, Rebekah G. Risk factors for stress during antenatal period among pregnant women in tertiary care hospital of Southern India. J Clin Diagn Res. 2015;9(10):QC01-5. doi: 10.7860/JCDR/2015/13973.6580. [PubMed: 26557568]. [PubMed Central: PMC4625287]. 7. Cookson H, Granell R, Joinson C, Ben-Shlomo Y, Henderson AJ. Mothers' anxiety during pregnancy is associated with asthma in their children. J Allergy Clin Immunol. 2009;123(4):847-53 e11. doi: 10.1016/j.jaci.2009.01.042. [PubMed: 19348924]. [PubMed Central: PMC2726292]. 8. Urizar GG, Jr, Milazzo M, Le HN, Delucchi K, Sotelo R, Munoz RF. Impact of stress reduction instructions on stress and cortisol levels during pregnancy. Biol Psychol. 2004;67(3):275-82. doi: 10.1016/j.biopsycho.2003.11.001. [PubMed: 15294386]. 9. Bapat RA, Kumari S, Nagendra HR. 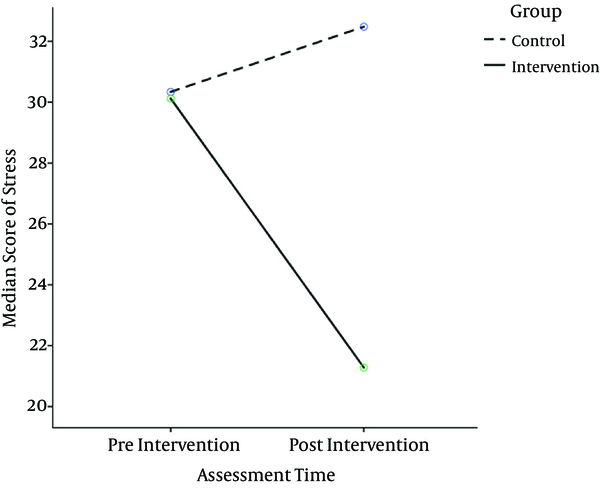 The effect of one month yoga intervention on perceived stress and anxiety in pregnant women. J Women Health Issue Care. 2016;5(3). doi: 10.4172/2325-9795.1000233. 10. Hamilton JG, Lobel M. Types, patterns, and predictors of coping with stress during pregnancy: Examination of the revised prenatal coping inventory in a diverse sample. J Psychosom Obstet Gynaecol. 2008;29(2):97-104. doi: 10.1080/01674820701690624. [PubMed: 18484440]. 11. Ghasemi S, Nazari M, Vafaei H, Fararouei M. The impact of educational intervention based on the theory of planned behavior in choosing delivery mode in primigravida pregnant women. Int J Women Health Reprod Sci. 2017;5(1). doi: 10.15296/ijwhr.2017.09. 12. Chaturvedi RD, Saraswat A, Ardeshir A, Parmar N, Singh PR. Happify yourself-a psychological search for happines factors governing happiness in the contemporary indian society: A cross-sectional study. EBSCO, USA. 2015;5. 13. Veenhoven R. The utility of happiness. Soc Indicat Res. 1988;20(4):333-54. doi: 10.1007/bf00302332. 14. Veenhoven R. How do we assess how happy we are? Tenets, implications and tenability of three theories. Happiness econom polit. 2009:45-69. 15. Fordyce MW. Development of a program to increase personal happiness. J Counsel Psychol. 1977;24(6):511-21. doi: 10.1037/0022-0167.24.6.511. 16. Fordyce MW. A program to increase happiness: Further studies. J Counsel Psychol. 1983;30(4):483-98. doi: 10.1037/0022-0167.30.4.483. 17. Bitsko MJ, Stern M, Dillon R, Russell EC, Laver J. Happiness and time perspective as potential mediators of quality of life and depression in adolescent cancer. Pediatr Blood Cancer. 2008;50(3):613-9. doi: 10.1002/pbc.21337. [PubMed: 17879282]. 18. Khayeri F, Rabiei L, Shamsalinia A, Masoudi R. Effect of Fordyce happiness model on depression, stress, anxiety, and fatigue in patients with multiple sclerosis. Complement Ther Clin Pract. 2016;25:130-5. doi: 10.1016/j.ctcp.2016.09.009. [PubMed: 27863602]. 19. Glanz K, Rimer BK, Viswanath K. Health behavior and health education: Theory, research, and practice. John Wiley & Sons; 2008. 20. Maddux JE. Self-efficacy: The power of believing you can. In: Snyder DCR, Lopez SJ, editors. Handbook of positive psychology. New York, NY: Oxford University Press; 2002. 21. Kaufman DM. Applying educational theory in practice. ABC. 2002:1. 22. Zimmerman BJ. Self-efficacy: An essential motive to learn. Contemp Educ Psychol. 2000;25(1):82-91. doi: 10.1006/ceps.1999.1016. [PubMed: 10620383]. 23. Ghomi Avili E, Abolghasemi S. Comparison of perceived stress and happiness in trained and untrained pregnant women. J Curr Res Sci. 2016;(1):279. 24. Jayasvasti K, Kanchanatawan B. Happiness and related factors in pregnant women. J Med Associat Thailand. 2005;88:S220-5. 25. Cohen S, Kamarck T, Mermelstein R. A global measure of perceived stress. J Health Soc Behav. 1983;24(4):385-96. [PubMed: 6668417]. 26. Carolan M, Barry M, Gamble M, Turner K, Mascarenas O. The Limerick Lullaby project: An intervention to relieve prenatal stress. Midwifery. 2012;28(2):173-80. doi: 10.1016/j.midw.2010.12.006. [PubMed: 21371795]. 27. Khodarahimi S. Happiness and worry in an Iranian adolescents and young adults sample. Int J Psychol Counsel. 2011;3(4):71-8. 28. Scully D, Kremer J, Meade MM, Graham R, Dudgeon K. Physical exercise and psychological well being: A critical review. Br J Sports Med. 1998;32(2):111-20. doi: 10.1136/bjsm.32.2.111. [PubMed: 9631216]. [PubMed Central: PMC1756084]. 29. Ogier-Price AJ. Can happiness be taught? The effects on subjective wellbeing of attending a course in positive psychology that includes the practice of multiple interventions. University of Canterbury; 2008. [Dissertation]. 30. Argyle M. The psychology of happiness. Routledge; 2013. doi: 10.4324/9781315812212. 31. Rabiei L, Mazaheri MA, Masoudi R, Hasheminia SA. Fordyce happiness program and postpartum depression. J Res Med Sci. 2014;19(3):251-6. [PubMed: 24949034]. [PubMed Central: PMC4061648]. 32. Samadzadeh M, Shahbazzadegan B, Abbasi M. Study of Fordayce happiness model effectiveness on quality of life in patients undergo dialysis and patients who suffering from cancer. Soc Behav Sci. 2013;83:644-9. doi: 10.1016/j.sbspro.2013.06.122. 33. Feicht T, Wittmann M, Jose G, Mock A, von Hirschhausen E, Esch T. Evaluation of a seven-week web-based happiness training to improve psychological well-being, reduce stress, and enhance mindfulness and flourishing: A randomized controlled occupational health study. Evid Based Complement Alternat Med. 2013;2013:676953. doi: 10.1155/2013/676953. [PubMed: 24489588]. [PubMed Central: PMC3893772]. 34. Huffman JC, Mastromauro CA, Boehm JK, Seabrook R, Fricchione GL, Denninger JW, et al. 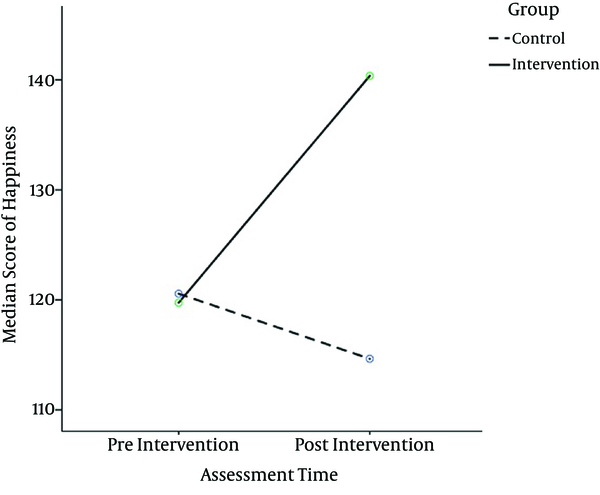 Development of a positive psychology intervention for patients with acute cardiovascular disease. Heart Int. 2011;6(2). e14. doi: 10.4081/hi.2011.e14. [PubMed: 23825741]. [PubMed Central: PMC3699107]. 35. Baban A, Craciun C. Changing health-risk behaviors: A review of theory and evidence-based interventions in health psychology. J evidence-based psychotherap. 2007;7(1):45. 36. Chan MY, Ip WY, Choi KC. The effect of a self-efficacy-based educational programme on maternal breast feeding self-efficacy, breast feeding duration and exclusive breast feeding rates: A longitudinal study. Midwifery. 2016;36:92-8. doi: 10.1016/j.midw.2016.03.003. [PubMed: 27106949]. 37. Breso E, Schaufeli WB, Salanova M. Can a self-efficacy-based intervention decrease burnout, increase engagement, and enhance performance? A quasi-experimental study. High Educ. 2011;61(4):339-55. 38. Solhi M, Kazemi SS, Yazdani J. The effect of educational intervention based on self-efficacy theory on general health status of women in Chaloos, Iran. J Health Dev. 2014;3(2):150-62. 39. Cieslak R, Benight CC, Rogala A, Smoktunowicz E, Kowalska M, Zukowska K, et al. Effects of internet-based self-efficacy intervention on secondary traumatic stress and secondary posttraumatic growth among health and human services professionals exposed to indirect trauma. Front Psychol. 2016;7:1009. doi: 10.3389/fpsyg.2016.01009. [PubMed: 27458407]. [PubMed Central: PMC4930928]. 40. Horiuchi S, Tsuda A, Toyoshima N, Aoki S, Sakano Y. Association of increased levels of happiness with reduced levels of tension and anxiety after mental stress testing in Japanese college students. Psychol. 2013;4(9):682-7. doi: 10.4236/psych.2013.49097. 41. Gholamali Lavasani. M , Rastgoo L, Azarniad A, Ahmadi T. [The effect of happiness cognitive-behavioral training on self-efficacy beliefs and academic stress]. J Cogn Strat Learn. 2014;2(3):1-18. Persian. 42. Piqueras JA, Kuhne W, Vera-Villarroel P, van Straten A, Cuijpers P. Happiness and health behaviours in Chilean college students: A cross-sectional survey. BMC Public Health. 2011;11:443. doi: 10.1186/1471-2458-11-443. [PubMed: 21649907]. [PubMed Central: PMC3125376]. 43. Raymond JE. 'Creating a safety net': Women's experiences of antenatal depression and their identification of helpful community support and services during pregnancy. Midwifery. 2009;25(1):39-49. doi: 10.1016/j.midw.2007.01.005. [PubMed: 17397975]. 44. Beevi Z, Low WY, Hassan J. Impact of hypnosis intervention in alleviating psychological and physical symptoms during pregnancy. Am J Clin Hypn. 2016;58(4):368-82. doi: 10.1080/00029157.2015.1063476. [PubMed: 27003486]. 45. Hyde JS, Else-Quest N. Half the Human Experience. Nelson Education; 2012.